Ah! Let’s have the Valentine's Day romantic atmosphere fill in every corner of the world.” Unbelievable? No. We actually think that couples who fall in love deeply will have crazy ideas like this on Valentine's Day. Valentine's Day is a date with sweetness even in the air; but if you want to add extra dreamy feeling, sending a fairy-tale-like Valentine's Day gift to your loved ones is the best choice. You May Not Know: Lapin Bunny, who came from France with the most Parisian Eiffel Tower chocolate and the mysterious magical French preserved pink rose will show up on this unique Valentine' s day, she is destined to become your "Guardians of Love" and pray for your beautiful love. 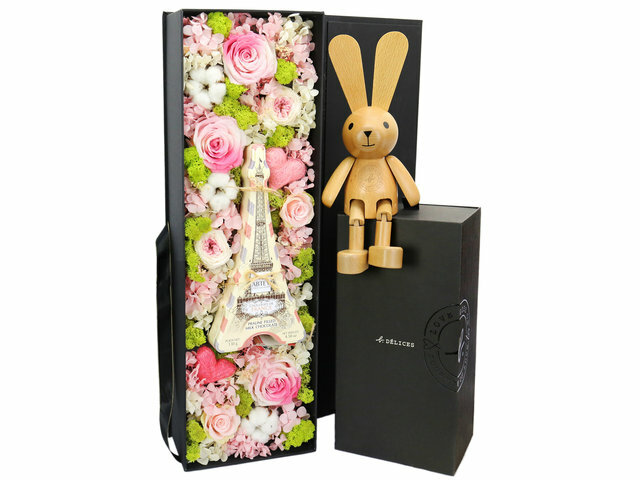 On this Valentine's Day, Hong Kong Give Gift Boutique takes "Guardians of Love" as the theme of our flower gifts and launches a series of valentine's gifts with Lapin wooden rabbit as the major gift item and a collection of chocolate desserts as well as preserved flowers. This flower chocolate gift combination is not only romantic like a fair tale story, but also beauty and tasty with creative elements. How can any ladies resist the temptation of this Valentine's Day agnes b. gift? Eiffel Tower Chocolate: Abtey Chocolatier, France, Pralines Milk Balls in Tin. Premium Preserved Rose: Designed and decorated by Give Gift Boutique Florist using imported preserved flowers of high quality. Wooden rabbit safeguards your love, chocolate adds a sweet taste, and preserved rose flowers stop the time and remain love in its most beautiful moment forever. This is a Hong Kong GGB original 'WOW! Dreamy Valentine's Day Gifts, From Magical Rabbit to Flowers and More...' blogpost.